The Graveler is a rock-based desert or mountain species closely related to a frog. Due to its thick exterior, the infant Graveler, or Geodude usually hatches without all limbs appropriately developed. For this reason, the Geodude's legs and center arms are weak and unused. Its primary arms are typically very large and accustomed to carrying the weight of its entire body. By the time it reaches maturity, its legs and center arms are fully developed and can contribute to mobility. Its center arms will always remain small, even though the rest of the body may continue to grow. Its rock-like exterior is technically a form of camouflage, however it is more like an adaption to its terrain than anything else. Many rock-like protrusions form along its back and upper arms, protecting it from harsh terrain and sunlight. One of the most iconic features of the Graveler is its ability to roll up its body and condense into form almost indistinguishable from a rock. Usually a Graveler will will reach the end of its life without evolving any further. When a Graveler continues training itself, or is helped extensively by a human trainer it will continue to grow. Eventually its body will become too heavy to carry with its arms alone, however it develops the capability to roll through its terrain at incredible speeds when in its balled-up form. Finally, the rock-like growths begin to quickly expand and thicken into an armor. The majestic and legendary fire horse of the north. While the flames that combust from its hooves and mane are hot and bright, it should be known that they are not actually made of fire. The Rapidash naturally releases a bioluminescent gas from pores on its back that mimic the bright flames of a forest fire. This natural reflex was most likely developed millions of years ago when the species was still evolving in areas rich with volcanoes as a way to ward off predators. A Rapidash has the ability to control the heat of these flames. In some instances, the flames can actually be quite hot, even doubling its natural body temperature. Human beings who are able to gain the trust of a Rapidash can ride it without getting burned or otherwise hurt. The Slowpoke is a rather mundane creature. While it is usually quite a happy animal, it lacks the general energy to move quickly or defend itself. It tends to live near saltwater and spends most of its days swimming or sleeping on shoreside rocks with its tail in the water. The end of its tail has several deep pores in its body that release strong pheromones that are generally used to attract a mate. As it would seem, the average Shellder happens to be attracted to the Slowpoke pheromones. The Shellder will swim up to the tail of a Slowpoke while it's in the water and latch onto it. The acids that secrete inside the Shellder act as a growth hormone when they enter the pores on the tail, and cause the Slowpoke to evolve. The Shellder, on the other hand begins to evolve around the slowpoke and form its bones to match the shape of the tail. The two then live the rest of their lives symbiotically. 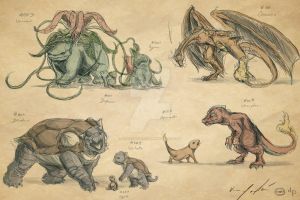 seen alot of these realistic pokemon drawings all over the site but theres something about yours that makes the most sense, its obvious youve put time into their designs. All of em ive seen so far have been really good. I absolutely love Geodude and his evo! I didn't know how to make him realistic, but you sucessed in it! I thought shellder was supposed to be a clam... you know, one of those things that DONT have bones? I love slowbro's smile. It gives of the impression, ' Hehehe, you know I'm lazy." 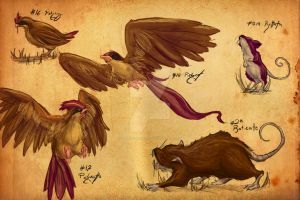 Wow this is a amazing concept of realistic pokemons! I love how you did the texture of those rock pokemon! and the fire pokemons look really awesome too!